Few days back, the first android one smartphone in Nigeria, infinix hot 2 x510 received the android 6.0 marshmallow update. While the update seemed as a good news, it turned sour when it was discovered that the update comes with quite a lot of bug. Some noticeable bugs includes lagging, unable to access files, stored names no longer showing on dialed list amongst others. We even discovered that IMEI cannot be changed easily like in the case of when the smartphone was running stock android lollipop OS. Thanks to Richard who mentioned via comment that the IMEI can be changed after the phone as been rooted. Anyway, we have received quite a lot of complaints and readers asking for tutorial on how to downgrade the OS from android 6.0 marshmallow to android 5.1 lollipop and we have decided to do justice to that. After hours of trial by error, we finally arrived at a working process and yes, i already have it done on my unit of the infinix hot 2 x510 phone before coming on here to share the steps with you. Without much talks, let’s hit the hammer on the nail but first, it’s very important you back up your files, apps and contacts before going on with this. The flashing process will wipe everything on the phone leaving only the pre-installed applications. Thus making your phone look like the first time you bought it. Hence, backing up your files, apps and contacts is very important except you don’t need them anymore. For files like pictures, music, videos etc, i would recommend using your computer in copying all files to a separate folder on your PC. You can just create a new folder on a directory on your PC with the name ‘My Infinix Hot 2 files‘ or anything else and paste the files in the folder. That way, it will be easy to locate them when you intend copying them back to your phone after the flashing process is completed. For the sake of ease, i would recommend creating this folder on the desktop. It should be easy from that angle, or what do you think? For contacts, you can back them up to your Google account so that when you are done with the flashing process and you input your gmail details on the phone, they’d reappear. For apps, i would recommend using titanium backup or Apps back up & restore. In my case, i used the App Back up & restore app and when i was done backing up the apps, i moved them from the internal storage folder (that’s the directory where the apps are originally backed up to) to my SD card using the phone’s file manager app in other not to lose them after the flashing process is complete. Done with that? You can then proceed with the requirements below. Oh! Least i forget, if you have already changed your hot 2 imei number to a bb imei, simply copy out the imei to a save place and simply re-change it after the flashing process is complete. VCOM drivers installed on your computer. You can read this post for a step-by-step guide on how to. Windows 8.1 and windows 10 users would have disable Driver Signature verification first before installing the drivers. 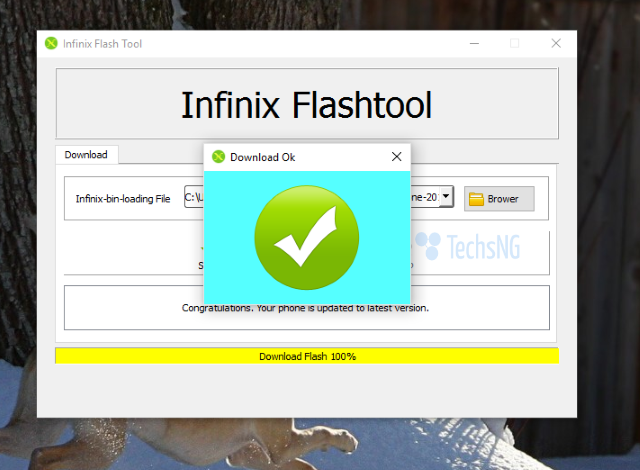 Infinix FlashTool. You can download Here. 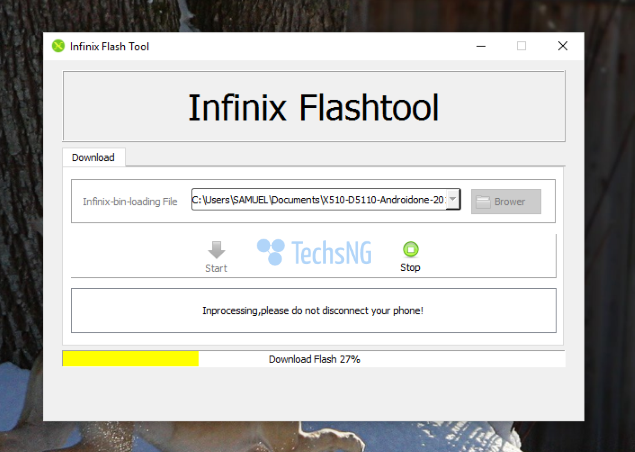 I am recommending infinix flashtool because that’s what actually worked for me. SP flash tool couldn’t perform the flashing process on my two laptops till i decided on using the infinix flashtool which worked out well. Infinix Hot 2 x510 AndroidOne Stock ROM. You can download here (link removed). Got everything in place? Now, let’s move on with the steps. ==> First, as stated above, install the VCOM drivers on the computer. 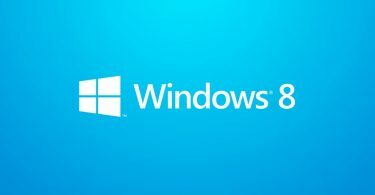 Windows 8.1 and windows 10 users would have to first disable Driver Signature verification before installing the drivers. After successfully installing the drivers manually, you can move on to the next step. ==> Using extracting programs like WinZip, extract the downloaded stock rom to a folder on your computer where you can easily access. Do same for the downloaded infinix flash tool. ==> Go the folder where you extracted the Infinix flash tool into and right click on the Flash_tool file and choose to run as Administrator. ==> When the programs loads up, click on browser and navigate into the extracted stock rom folder and select the MT6580_Android_Scatter file. 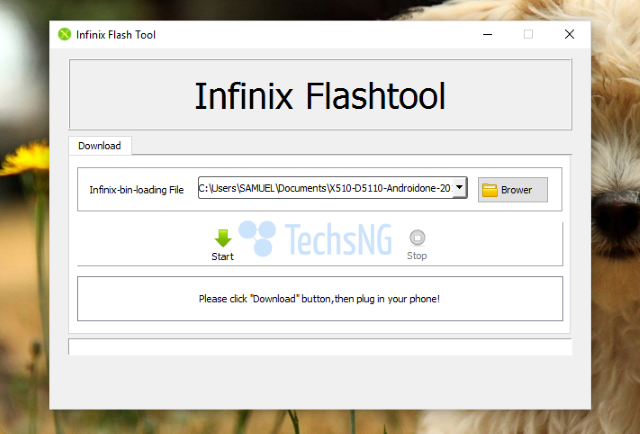 ==> Click on the start button and then, turn off your infinix hot 2 x510 phone and when the phone is totally turned off, connect it to your PC using it’s original USB cable and the flashing process should commence. ==> Please be sure not to shake or disturb the whole process till the flashing process is complete. If the usb cable ‘mistakenly’ disconnects or shakes, it will brick the phone. Hence, you should leave it till the process is complete. When completed, you should get the check mark as seen in the image below. When you get the check mark, you can disconnect your phone and turn it on. 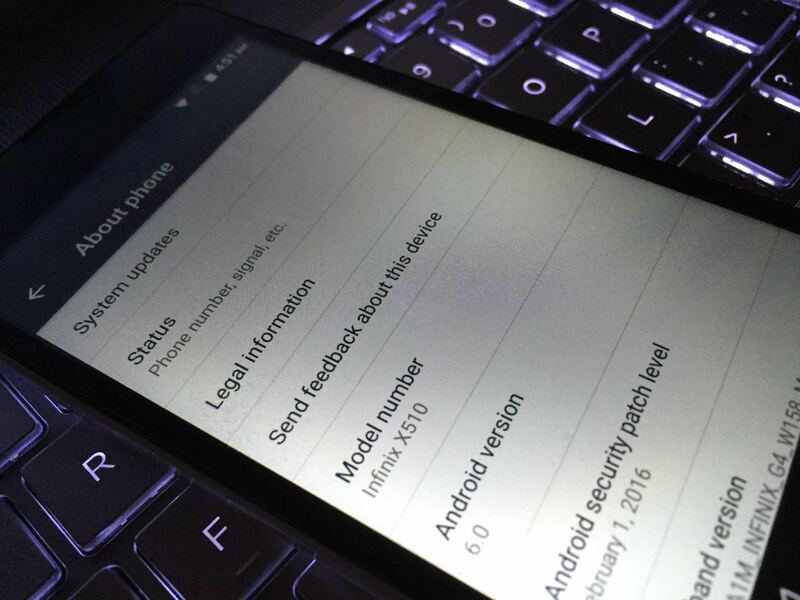 At first booting, it will take quite a long time but don’t panic, your phone is safe. So, there you have it. You have successfully downgraded your infinix hot 2 x510 android phone running 6.0 marshmallow OS to Android 5.1.1 OS. The next step at this point would be restoring your files and synchronizing your Gmail account with the phone in other to display your saved contacts. This OS is the stock android one OS that comes with the infinix hot 2 x510 smartphone out of the box. However, since it was discovered that the OS doesn’t support OTG cable, i decided to flash in another hot 2 x510 rom i would consider as custom because of the added features, User Interface and the OTG functionality. Some of us still very much need that USB On-The-Go (OTG) love. Of course, you shouldn’t bother yourself with this if you just need your phone for it’s basic functions. Yes, Divine. That can work too. My phone wont turn on after doing everything you mentioned above, pls help me. 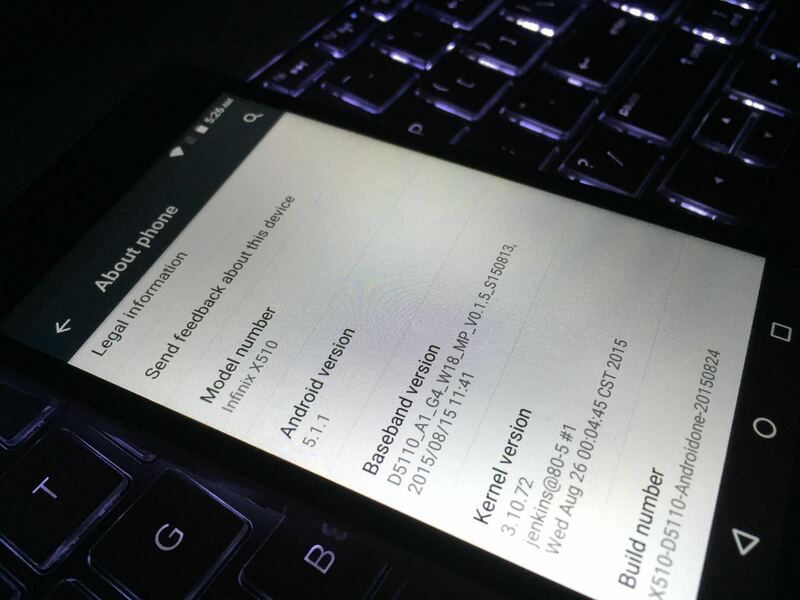 Are you sure you flashed in the right ROM file for the right version of the device? Remember the device is available in two variants. Sorry, I guess I missed your question. What OS version is your phone currently running on? Slimzy, the last time i checked, the Marshmallow OS on the hot 2 wasn’t stable. Hence, i would advise you downgrade to Android lollipop. The information above should guide you though. Please Sam, I try downloading the Stock ROM but it showing me download not available, what can I do please. Bro pc can’t detect my infinix x510 when it is on. Can i still go ahead and do the flashing? Abu, you may have to download the 5.1 lollipop rom and flash that into the phone. hi, please the thing is my pc has not been able to recognise my phone since i upgraded to marshmallow… this is probably y der isnt any progress at all… way out please? One more thing. I think mine is the 1gb ram version. Will it work?? hello sam. thanks for the post. am about to try this method to downgrade my infinix hot 2 x510.. am using a windows 8. i followed every instruction but when installing the VCOM drivers, i get an unsuccessful response at the final stage. maybe because my laptop spec isnt listed. but how ever, when i switch off the phone, and open device manager in my laptop, and connect via usb cable, i see this MT65xx Preloader but with the yellow caution. and will disappear after sometime. does that mean that everything is set?? should i proceed with flashing?? please get back to me thank you.. Precious, i only used the window 7 and windows 10 in doing the flashing process. For windows 8, i think you also need to disable driver verification. Have you done so? Adam, are you sure you flashed in the correct ROM? my infinix hot 2 phone after upgrading to marshmallow android version it is now responding to wifi conections. thank , my phone is back on 5.1.1 i am very happy!!!!! SAM help me i did everything well but i can’t turn on my phone,even when i’m charging it nothing happening plz help me it’s been 2 days help me………. Please I can’t transfer files from my phone to PC via USB using infinix hot 2 Android version 6.0.. please help? please check your load matches to your target which is to be downloaded. i got the same problem can someone help please !!! Souf, did you get any error during the downgrading process or are you currently being faced with any error? Anonymous, probably you did something wrong. Just keep charging the phone till it shows the charging icon, leave it till it’s fully charged. Thereafter, re-flash the rom again. is it necessary to flash the Hot 2 x510 AndroidOne Stock ROM before i can flash the one you called custom or i can flash the custom one straightaway from Marshmallow? Seun, you can flash the custom rom directly. Okay, this is the first time i am trying to download from mega link, the download progress is only shown on the webpage, does it come on the local drive after it finishes or how does it work? Hae Sam,can I use windows 7 using 32 bits? Alex, what windows is your PC running on? my process has not yet started and its already 10minutes past the time i plugged in the USB. Also, the windows I use on my laptop isn’t verified i.e. It’s unofficial. Will it still work. As it brings a warning of the windows you are using is not genuine. Sorry, ROM not Romantic as seen above. Autocorrect issues. Thanks for your post. But I have a problem. At the initial stage, the link you posted for us to download the stock romantic for 5.0/5.1 is taking me to the download link for Mega V5 in Google play store. Mega V5 is a cloud storage device just like Google drive and not an OS. Or am I getting something wrong. I’ll be grateful for a swift answer. Thanks. Godwin, glad it worked well for you and you are enjoying more features on the phone than others. Cheers! Guess we have been able to rectify your issue as a result of your phone call. hey, what if the flash processing not want to start? how loh I should wait? Anonymous, confirm that the VCOM drivers is properly installed. i wished we could see physically so you could help me with this, is that possible? Chris, feel free to ask your questions on this blog and i will assist in the best way i can. Cheers! Million thanks my friend, I have successfully downgraded my infinix X510 back to Lollipop. Please i need to downgrade back to 5.1.1 with a windows 8 computer. I need your help!!!!!!!!!!! i have gone through all the processes but for 30 minutes now the inprocessing have not even given me a one percent download. is it possible and if so how long is it going to take for the process to finish when you estimate the time. Appau, i am guessing the flash tool isn’t reading the phone yet. Please confirm that you have properly installed the VCOM drivers. i am in tears now…..i think my phone has bricked, it wont boot….it comes on but wont pass the infinix stage when booting….whhat should i do next?…..
Kas, flash in the appropriate ROM. That should fix things if done properly. Anonymous, did you disable driver signature before installing the drivers?? Yes, the scatter file has the extension .txt. Wow… Thanks brother… Now I know why my hote note pro got hard bricked for the past four days…. No sign of life till now..I don’t know the 2GB+32GB is note pro… I flashed in hot note stock rom into it..will it still come on Broadway, this is the fourth day, if it does, will sp flash tool do the upgrade if I v it’s stock room. Hi Samuel, infinix x551 with 2GB+32GB…Is it a note pro or normal hote note? Thanks. Ade, it’s hot note pro. The normal hot note is 1GB RAM and 16GB ROM. Hi Samuel, infinix x551 with 2GB+32GB…Is it a note pro or normal hote note? Thanks..
Doha, your phone isn’t freezed so don’t worry, you are safe. If it seems as though your phone isn’t turning on, just remove the battery and turn it back on. Make sure the vcom drivers are properly installed. If using windows 10, remember to disable what i asked you to disable then recommence the whole process. Please is this OS for the 1Gb Ram version? Felix, I used it on a 2GB RAM version. please, is this for the 2gb ram cause that’s what am using. Dante, Yes it’s for the 2GB RAM version. Alex, just back up, downgrade and restore your files. It should be good afterwards. After I upgraded my hot2 from 5.1 to 6.0…. I could not find all my files in my internal memory… But in the storage it show nothing has been wiped off (10.79GB used from 11.73GB)… How can I get them back ? Sam,did your previous files come back the ones you were with before upgrading to 6.0? Alex, i didn’t actually lose my files in the first place. Maybe because i used the stock recovery method. However, as long as you made a backup of your files before downgrading, you should be able to see them when you restore the files. Raheem, if using windows 10, please disable drivers signature verification before installing the drivers again. Yes Desmond. In my case, i usually switch between them. I.e, if one doesn’t work, i try the other. Just like the infinix flash tool didn’t work when i was installing xui update on zero 2 but worked on hot 2. Juliet, as long as you backed your files up as stated in the post above and you restore them after downgrading, you should have them on your phone. 5KPlayer : Best Free Video Player For Windows 10 / Mac in 2019?